"Last warning". Not really a warning when he's attacking you. All this time I thought he was speaking in the draenei language saying smtg weird. Now I realised he says ''follow the rules''. Just as a point of interest - this minion's Battlecry will trigger BEFORE Swamp King Dred attacks, meaning that it would only be hit with one damage. The same effect works with Eadric the Pure. 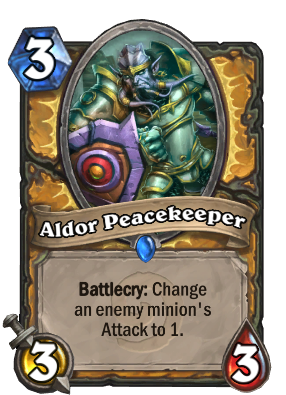 I'm of two minds about this aldor guy. Used to hate him when he was played against me... but now I just found one in a pack, and I'm already thinking of how I will use him. Ah, human nature! Quite possibly the most annoying card in Hearthstone. golden animation actually looks like windfury in the game. This would be good as a 2/3. It'd probably still see play as a 2/2. As someone who loves playing big creatures, I really don't like this guy. In what world is this card balanced? So "Following the Rules" is having a 1 attack, when he himself has a 3 attack... Typical self-righteous hypocrisy. TOO SOON! YOU HAVE AWAKENED ME TOO SOON EXECUTUS!!! Peace cannot be kept if the enemy can still attack! "Swallow my jewels!" Great combo with Stampeding Kodo.